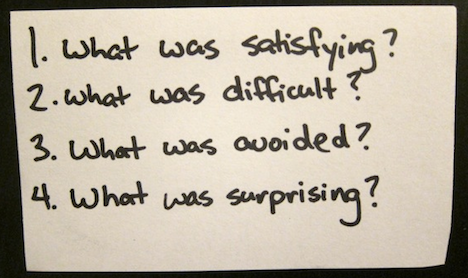 This week we look at what happened one week after Nancy started using her Personal Kanban™ system (read part one here). It’s not enough to be busy. We’re all good at that! What we want is to be effective, to do the stuff that matters most. The first step to becoming more effective is to understand the current situation. Think about what you did yesterday, or 3 days ago. Now what if you wanted to see patterns of activity across a whole week? Heck, just remembering what one had for breakfast can be challenging. That’s where a visual management system like Personal Kanban™ shines. It can provide a complete picture, both a real-time snapshot and tell the story of your week, in ways that matter most to you. At the end of the first week, I helped Nancy reflect on her work. What we are looking for, after that first week, is mostly to increase her awareness, and to learn how to use the board to reveal valuable insights. The satisfying. Immediately, Nancy was delighted at all of the work that was sitting in her Done column. For the first time ever(! ), she had a reasonably accurate picture of what she had accomplished, and now could celebrate that. She also liked having everything in one place, in a way she could review quickly. This also helped a lot when she spoke with the management team, they knew instantly her situation and could provide useful feedback. The difficult. She also noticed there were several work items she had done that weren’t on the board. Building new habits takes time! The avoided. Lots of important work wasn’t getting attention. Why? Lots of interruptions, through emails, phone calls and visits, many with issues others perceived as urgent. She’s fighting lots of fires, which get in the way of doing the more valuable stuff. The second, very obvious reason looking at her board is she just has wayyyy too much work to handle. She is doing the work of 2 or 3 roles, and as a doer she struggles to delegate work to others. The surprising. Given all this was new, she was pleasantly surprised how easy and effective it was. The big a-ha, again was the work she wasn’t getting to, and the sheer volume of work she had. Get *all* work on the board, so we have an accurate picture of what is going on. To support this, I will check in with her at the start of each day to review the previous day, and act as a trigger to get any missing work up there. Answer the question, “How much completed work is unplanned?” For this, we decided to mark each completed item with a red dot the moment it goes into the Done column. We also organized done by the days of the week, to see if that might uncover additional data. 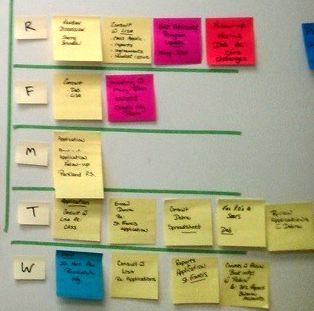 Answer the question, “How much work am I getting done in a week?” This is easy to do, we just count up the post-its in the Done column at the end of the week. So, in just one week, Nancy learned a lot more about how she works, the work she has to manage, and gained valuable insights in how to make her work life better. Most of all, she has greater confidence she can change things for the better. In the next excerpt we’ll see how Nancy does with those improvement goals. This new strategy is well-conceived and much needed.